Good Evans! What a line-up! The line-up for the Tony Evans Winter League fished on the Decoy Lakes complex which started last weekend reads like a who’s who of top quality matchmen. The series is all based on section points, but looking at the field just to win a section must feel like a match win! The first round saw Ian Frith top the field, but I am sure after drawing the Four Island Pool he must have felt disappointed with only section points to go for. Most of the lakes produced good weights but Frith put a fine 113lb 10oz to the scales from peg five to steal the show. He fished pellet over micro pellets for most of the day taking a few bigger samples on sweetcorn from the margins late on in the match. Runner-up was Simon Dow, who drew 29 on the Willows and caught on the pole and pellet for 117lb 6oz. Full result: 1 Ian Frith 133lb 10oz; 2 Simon Dow 117lb 6oz; 3 C. Cole 110lb 10oz; 4 J. Whincup 108lb; 5 S. Godfrey 100lb. JVAC fished a bitterly cold and windswept Oak Pool at Decoy on Sunday. Considering the weather though, some very reasonable weights were taken. Leading the way was Dan Abbott using a bomb and pellet approach, occasionally switching to sweetcorn on the hook, for 88lb 7oz. Roy Whincup put 46lb to the scales to take the runner-up spot, then came Alan Warren on 26lb. Six Islands at Decoy fished well for the Over 55s last Friday. Ramsey rod Keith Rayment won from peg 12 with 86lb 10oz caught on paste and cat meat over pellet. 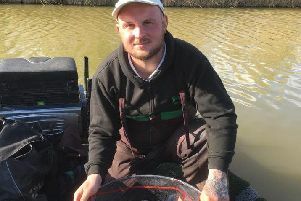 Gordon Parker came second on peg 21 fishing pellet then maggot for 82lb 1oz. Third place went to Tom Wilson, who weighed in a level 79lb.